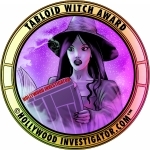 [HollywoodInvestigator.com] Earlier this month I was in Winnipeg, organizing a special "Best of the Tabloid Witch Awards" screening for the World Horror Convention, which met in Canada this year. As I do at every convention, I spent a good portion of my time touring the host city. 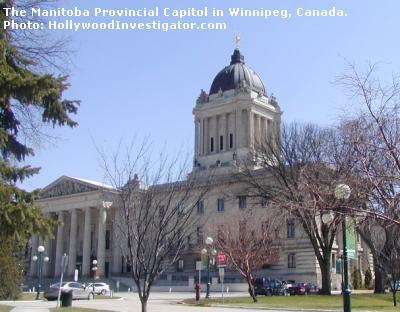 On May 3rd, I visited the Manitoba provincial capitol building, which is in Winnipeg. It was a Sunday afternoon. I didn't expect anything other than to view the capitol from the outside. I found a typical government building, massive and fronted by white columns. I climbed the steps to the entrance, not really expecting to gain admittance. To my surprise, the door was open. 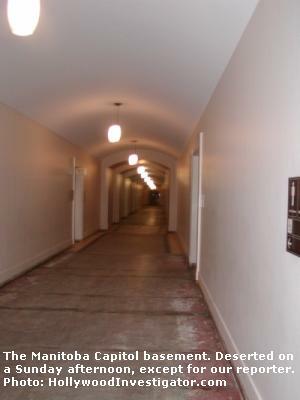 Inside, I found a solitary security guard behind a reception desk. I asked if tours were offered. Not on Sundays, I was told, but I was free to browse the building. The guard was pleasant and all smiles. He asked for my name and city of origin. He wrote it in a visitor's log -- but he never checked my I.D. I didn't lie, but I could have. I wore weathered khakis. A camera hung from my neck. Yet I passed through no metal detectors. No X-rays. No searches. The guard gave me a clip-on Visitor's badge. Then I was let loose in the provincial capitol, free to wander, free to photograph. Unescorted. 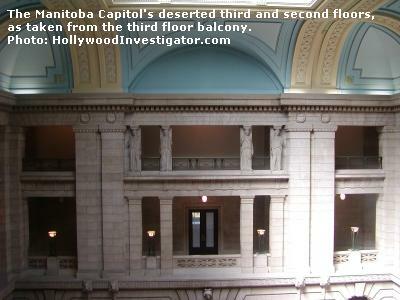 The capitol was deserted on a Sunday afternoon. I explored all four floors, from the basement to the top, clicking away with my camera. Most of the time I was alone, no one in sight. If there were any security cameras, I didn't see them. Even if I were being observed, no one rushed to stop my taking pictures. The level of trust placed in me, a foreigner (I'd truthfully told the guard that I was from California), was amazing. I can't imagine that many key U.S. government buildings would place as much trust in Americans, much less foreigners. No I.D. No metal detectors. No X-raying bags. In the U.S., guards get suspicious if someone is seen taking photos outside a government building. Consider the security measures -- and list of prohibited items -- that visitors to California's state capitol museum in Sacramento must undergo. Why do Canadians fear terrorists less than do Americans? I suspect it's because Canada has a reputation for minding its own business overseas. Canadian foreign policy has not been perfect. At times it's slavishly rubber-stamped British or American wars. 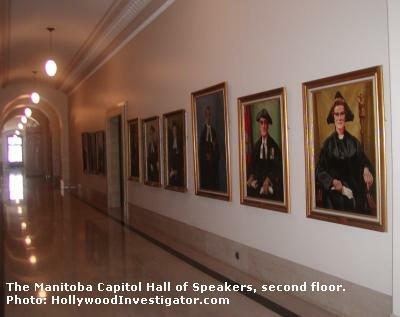 The hallways of Manitoba's capitol are covered with plaques commemorating all manner of people and events, including such insanities as the Boer War and World War I. Even so, Canadians have been minor followers of British and American imperialist policies, rather than policy-makers. Canada doesn't install foreign despots or fund ungrateful "allies" that oppress and kill innocent civilians. As a result, no one hates Canada for its freedom and prosperity. Its buildings are not terrorist targets. Imperialism creates enemies abroad. 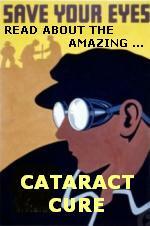 Which results in a police state at home. Thus, imperialism diminishes freedom for both the conqueror and the conquered. It's silly, but Canada still enjoys a vicarious thrill from its ties to the defunct British Empire. 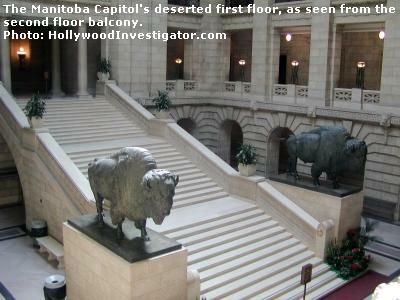 One plaque in the Manitoba capitol "commemorates the arrival on Canada's soil of those British subjects whose loyalty to their King, faith in God, and courage to endure hardships caused them to sacrifice their homes in the American colonies, and to pioneer in the Canadian wilderness. The mark of Honour, U.E., established by Order-In-Council No. 25 passed at the City of Quebec on November 9, 1789, and approved in London in 1790, was conferred upon the Loyalists and their descendants." This means that descendants of those Tories who fled the American Revolution for Canada get to affix U.E. after their names. U.E. stands for United Empire. Thankfully, now an empire in name only. More silliness: Canadians still recognize Elizabeth II as their queen. Okay, so Canadians are wrong about the American Revolution. And there are other things they can learn from us. Canadians are weaker on free speech ("hate speech" is a crime) and gun rights. Then there's their socialized medicine. But there are things the U.S. can learn from Canada. War and empire do not make a nation safe. Peace and non-intervention bring safety and security.